In MoP, we saw some of the most ridiculous flight paths ever conceived on basically all of the Western half of Pandaria. This isn't the only example, this is just the best one I could find. There are a LOT of examples of bad flight paths in Western Pandaria, even when you've unlocked all the flight paths (this picture is missing Two Moons/Seven Stars), there are still plenty of silly detours that exist. So one of my primary concern about WoD is that we're gonna see a repeat of this nonsense. I don't mind the lack of flying, but frankly Blizzard really needs to get their stuff together before they pull anymore of this. That's good alt-tab WoW forums time right there. I don't mind the lack of flying, but frankly Blizzard really needs to get their ! @#$ together before they pull anymore of this crap. Blizzard has stated numerous times, and likely will do so numerous more... anytime this sort of thing happens with flightpaths, let them know. They want to actively fix it. 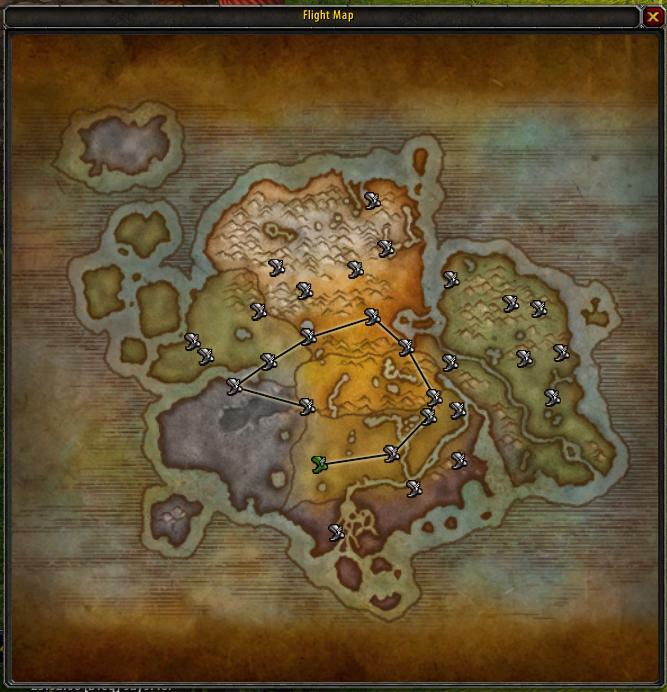 Compared to flight paths in Classic the ones in mists are well planned out. Man some people act as if blizzard knows every small detail of everything in this game, if you notice something out of place or wrong, and then keep it to yourself instead of reporting it, it will never get fixed. Flight paths have never been their strong suit. Hoping they go with teleporters or someting. Make that gnome technology work. They have said NUMEROUS TIMES that if the flight paths are taking bad routes to please SAY SOMETHING. Nothing's ever going to beat having to fly OVER Forest Song to Astranaar to get back to Forest Song. or that the flight path from Astranaar to Stonetalon required flying all the way up to Auberdine and back down to Stonetalon. You know, I have submitted multiple suggestions/concerns about the western Pandaria flight paths from as early as 5.1, but nothing ever came from them (I gave up on submitting them around 5.3). Unless it has been changed very recently, we still don't have direct flight paths between the majority of Townlong Steppes and Dreadwastes. It still takes about 4-5 stops to reach the Shado-Pan Garrison from the Vale, which is why I always fly straight to the Sunset Brewgarden and fly manually the rest of the way. If you fly from the Vale of Eternal Blossoms directly to the Timeless Isle, you will take a detour at Pang's Stead if you don't choose to fly directly to Dawn's Blossom. This may or may not be faster, I never got around to timing which route is the quicker of the two, but the fact that the detour exists (and may be faster) raises some questions in itself. As for Kalimdor, I recall that it always seemed strange that there were no flight paths between Sen'jin Village and Ratchet, you first had to fly to Orgrimar and then pass over the Crossroads before you could reach Ratchet. If you gave up on it you can't really be surprised when everyone else did too. That map wouldn't look like that if the Shrine flight point would have been "unlocked". Granted it still wouldn't have been a direct route but it wouldn't be as bad as that shows. On second thought, if the Klaxxi flight point had been "opened" as well you might be routed through there instead which would be much more direct. So it is the customers job to remind them over and over and over to fix something that should have been shaken out in Beta? I can't remember a time ever that they changed a flight path. We’re going to be making sure flight paths and other forms of travel are quick and efficient, with a goal of getting you to the places you want to go. Flight paths in the past have always been “the scenic route”, lazily listing from side to side and around waterfalls to the intended oohs-and-aahs of the transportee. The flight paths in Draenor are not going to be loop-de-loop sightseeing tours, and we’re going to be looking to our beta testers to let us know if any are less than tip-top. I mentioned that, but it doesn't explain why there aren't direct or nearly-direct flight paths between two points that are so close together. Even if the Shrine was unlocked, this would still be an example of unnecessary detours. I didn't take this particular screenshot, I found it by accident, but it reminded me of several of the other issues I listed in a previous comment. Honestly, I suspect the person who took this picture purposely omitted the Shrine in order to either prove a point or make a joke. Either way, this shouldn't be happening. So it is the customers job to remind them over and over and over to fix something that should have been shaken out in Beta? Why would you expect something to be fixed if no one points out there's a problem? Most people who got into the beta test used it as early access and bragging rights, not as a testing grounds. It's not Blizzards fault your peers failed to utilize the opportunity properly. I can't remember a time ever that they changed a flight path. Then you need to consult someone about your memory. Also hope that flightpath hubs are connected a bit more logically, too. Sometimes you have to connect to a more distant flightpath just to get to your endpoint even though the endpoint is closer. Look at that. Another blue post responding to a thread that violated forum rules. There is something wrong about that. Lol flight paths... I guarantee you that no flying is going to cost them more subs than Cata did. I think they're nitpicking over the last line of the OP.